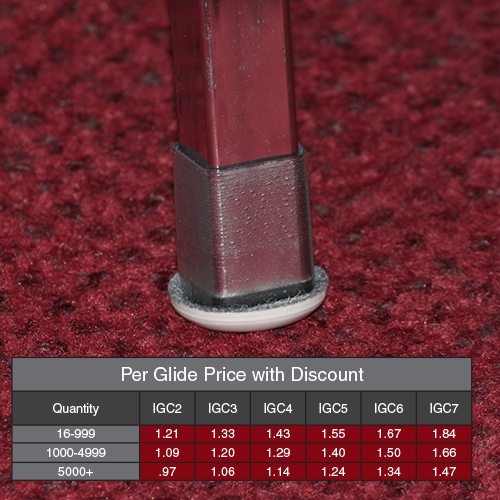 InvisiGlide Carpet Sliders prevent damage normally caused by moving furniture. The transparent, flexible sleeve securely forms to the size and shape of chair or table legs, eliminating the need for adhesive. The plastic tip causes less friction and distributes weight evenly for better furniture wear. • Protect floor surfaces from rips. • Distribute weight evenly to increase furniture longevity. • Reduce effort associated with moving furniture. Recommended for: All carpet surfaces. Versatile: One design fits multiple shapes and sizes. Attractive: Transparent sleeve blends in with most furniture.